Photography of the hair bearing areas, especially the scalp is essentially just an extension of clinical dermatological photography. Some points should however be kept in mind while taking photographs of hair disorders and is technically more challenging in view of the tendency for the light to glare from the shiny surface. The first issue that needs to be addressed in clinical photography of the hair is: what is the main purpose? Is it just documentation of the condition or as part of assessing progress/response to treatment? 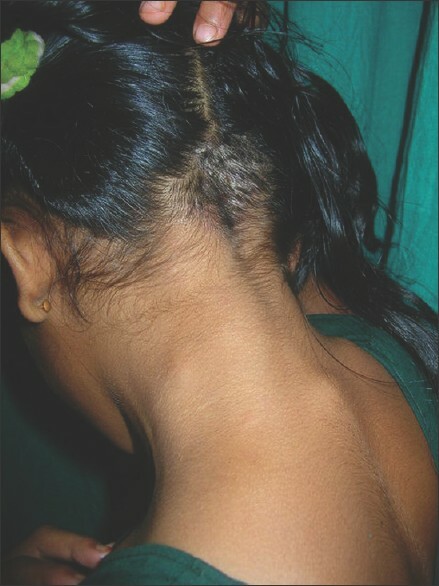 For example, in a case of Tinea capitis or discoid lupus erythematosus (DLE) of the scalp, you may need to take only a single image of the affected area for documentation, while for a case of androgenetic alopecia where you need to progressively assess and document the response to medical or surgical treatment, you need serial photographs taken in standard views for comparison. For simple documentation, the same general rules of dermatological photography apply, while the key for a good image series for documenting progress/response to treatment is consistency - in terms of patient positioning, lighting, camera settings, and background. How many megapixels (MP) do you really need? The amount of detail that the camera can capture is called the resolution, and it is measured in pixels. Basically, the more pixels a camera has the more detail it can capture. Also as the pixels increase, larger prints can be made without losing detail. Earlier studies have suggested that even a resolution of 1.3 MP is sufficient for dermatological photography. All modern dedicated digital cameras, even of the point-and-shoot variety have resolution upwards of 8 MP, so camera resolution is really not a major concern in terms of choosing a camera for clinical photography. 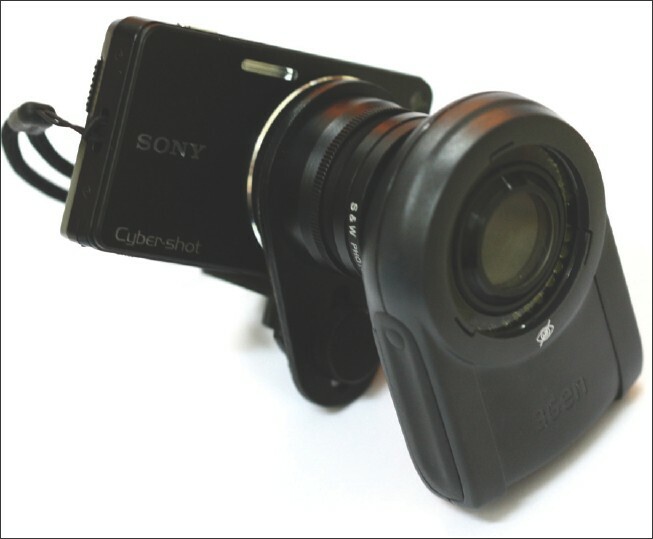 Many mobile phone cameras now come at high resolution ranging from 5 to 12 MP; however in spite of this resolution mobile phone cameras have various problems making them unsuitable for precision clinical photography, these limitations include absence of dedicate close-up/macro modes and difficulty in maintaining a standardized/consistent positioning or setting. Moreover, the reflection of light from the camera flash is an issue with mobile phone cameras too. A ring flash (which is basically a ring like light around the camera lens) can be attached on SLR cameras and helps in taking very close shots in low-light conditions for lesions essentially needing focus on the scalp, without the shadow of the camera lens falling over the lesion. They are dedicated and synchronize with the camera just like the built-in or any other external flash [Figure 4]. 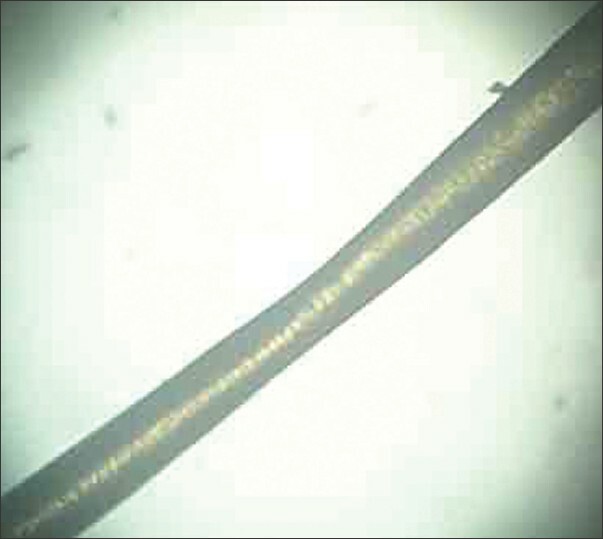 In Indian patients, oiled hair clumps and tend to produce more reflections. Hence, it is preferable to take photographs always when the hair is clean and dry. Another option is to use tissue paper to wipe and dry out the oil as much as possible prior to photography of scalp. A tripod is an essential tool to ensure standardized imaging of the hair especially in conditions like androgenetic alopecia. It not only helps us to use a consistent camera position and height, but also helps to prevent blurring of images which might occur when you are shooting without a flash. However, in clinical practice especially where space is a constraint, this can be overcome if the clinician (photographer) is competent enough to use the camera without mounting it on to the tripod. 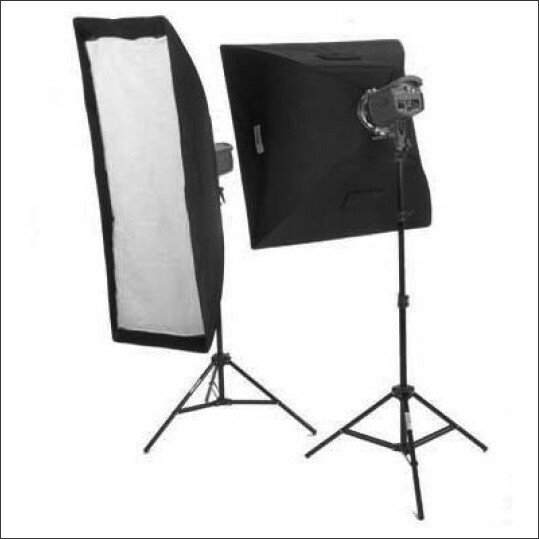 It would be ideal to use a commercially available reflector or a simple thermocol sheet to bounce the flash from the camera indirectly to the subject by placing the reflector as in the picture [Figure 3]. A dermoscope unit with a camera attached (which in turn can be attached to a computer monitor or a television screen) is very useful in diagnosis, documentation, and patient counseling. 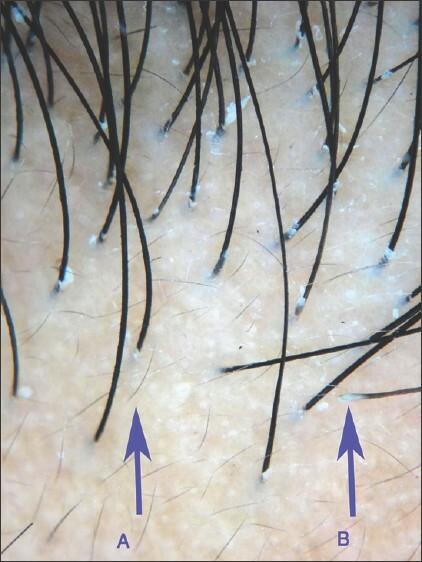 Hair dermoscopy (Also called trichoscopy) usually uses a magnification of 10X and can be combined with still or video images (videodermoscopy). Digital photography by itself is a great tool to educate and counsel the patient regarding his/her condition. Combination with dermoscopy enhances the ability to diagnose and document hair disorders. Specific changes have been reported on dermoscopy of different conditions affecting the hair, e.g. 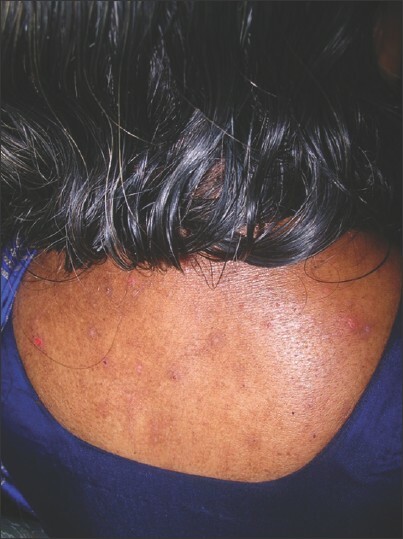 "yellow dots" in alopecia areata, peripilar brown depressions in androgenetic alopecia, and peripheral peripilar casts in Lichen planopilaris[Figure 5] and [Figure 6]. Trichoscopy is also useful in demonstrating structural defects like monilethrix. 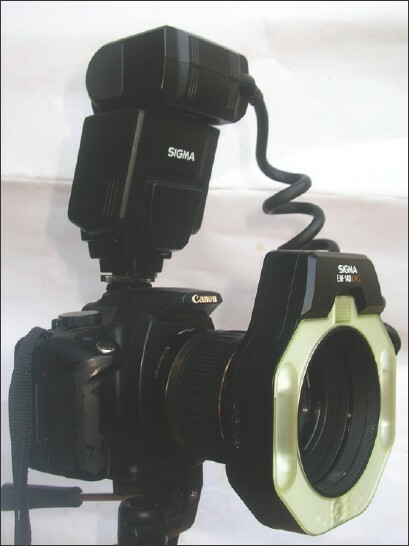 There are many dermoscopes available in the market which have adapters to attach digital cameras (The authors have used a DERMLITE pro HR II® attached to a Sony® W 350 camera) [Figure 7]. 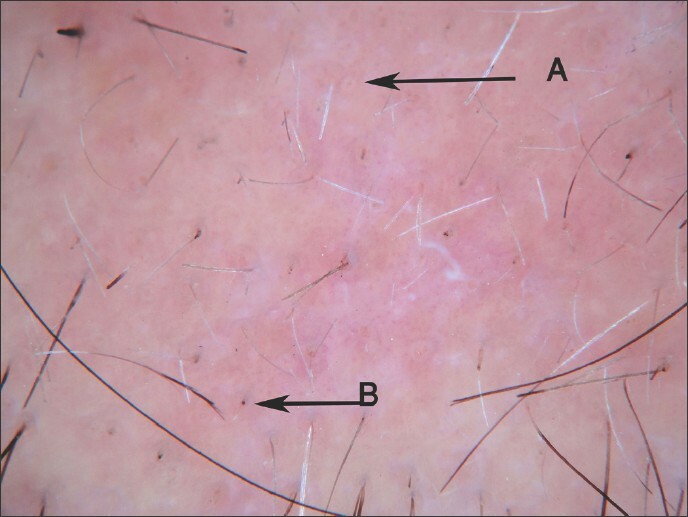 Dermoscopy would also be valuable in evaluating structural abnormalities of hair. Interestingly, another simple method to shoot microscopic images for hair shaft abnormalities is to place the camera lens over the objective of the microscope, with a transparent polythene film in between to prevent damage to the camera lens  [Figure 8]. Choosing what has to be photographed or in short what is to be included in the frame in the picture is the clinician's decision. It would be ideal if a normal anatomical area is included in at least one of the frames (e.g. Ear when taking lesions on the temporal area) so that the viewer gets an idea of the location. The area of clinical interest should preferably be kept in the middle of the frame [Figure 9]. The important lesions here is the lesion (not the hair as such) e.g. alopecia areata, DLE lesions over scalp, Lichen planopilaris, etc. It is always good to have multiple images (frame) per patient, so that the pictures are more descriptive. Take images from a distance of 3 feet to show scalp/area and the location of the lesion. Follow this with close-up images of the lesion preferably with an assistant to separate and hold down surrounding hair to prevent distracting focus from the area of interest. Use the macro mode/close up mode (denoted by the symbol ) without flash (with good ambient light) or with a ring flash (if ambient light is too less). You can later check and delete the poor quality images. The assistant can also hold a scale to document size of the lesion. Always make it a point to document possible associations to explain the clinical condition better. For e.g. in alopecia areata document nail pitting if present. 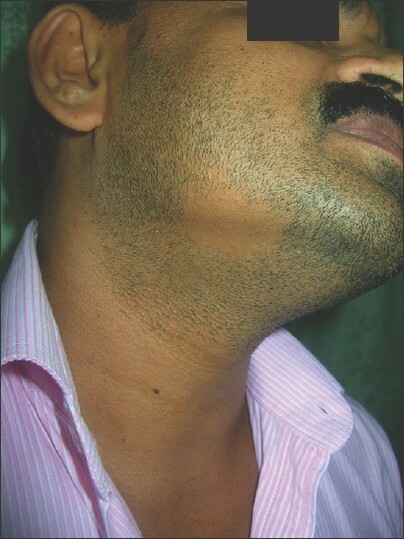 In Pediculosis, document excoriations over the neck and upper back [Figure 10] or a regional lymphadenitis if secondarily infected which are often seen in association [Figure 11]. A small area of the scalp can be selected (Marked with a tattoo/permanent marker) and assessed for hair count. The target area on the scalp is chosen, clipped and prepared, and permanently landmarked with a single tattoo for future site location. Controlled photographs are then taken, centrally processed, monitored for technical adequacy, and counted (Manually or with specialized software for the same). One way to accomplish consistent results is, always keep the camera lens parallel to the floor and position the patient to the camera and the use of a tripod is very ideal. For global photography of androgenetic alopecia the camera should ideally be held in the vertical format to maximize the clinical information recorded. An adjustable stool can be used in adjusting the patient position  [Figure 12]. For documenting clinical improvement with treatment and for severity scores, if possible it is always best to document the entire body involvement to obtain the Ferriman-Gallwey score  [Figure 13]. Here too it is essential to avoid reflections on the hair. 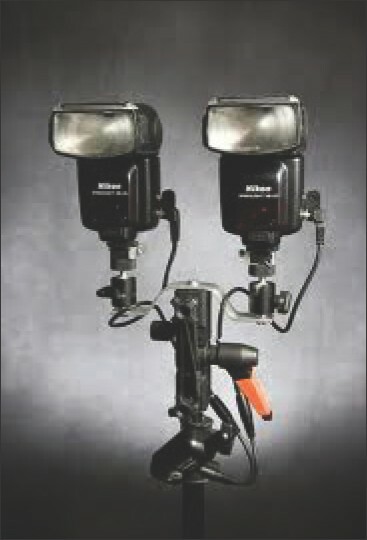 A twin flash system should be used when possible. Cover all angles as in androgenetic alopecia and take macro shots of representative areas. Make it a point to document associations on other parts of the body e.g. in Netherton's syndrome, always document the ichthyosis. Always ensure that patient's consent is documented before photographing, especially if the shots are taken during a surgical procedure when the patient may not be aware of the same. A written informed consent would be the best and is a must if one is planning to use the photograph for publications. Include the patient's hospital card, tag or number in all or at least one of the images of a series so as to enable easy identification later. Storage: Most digital cameras save the images by default at a resolution of 72 dpi in the JPEG (joint photographic expert group) format. This can be converted to 300 dpi with the use of basic photo-editing software. The resolution of 300 dpi is the general standard for most journal submissions. The most preferred format is JPEG. Ensure that the images are backed up in at least two locations. Always catalog all saved images (or containing folders) tagging it with the patient's name, hospital number, date and provisional diagnosis where applicable. Meticulous cataloging is cumbersome, but makes future retrieval of imaging very convenient. One methodology which the authors follow is to create multiple folders with diagnosis as folder names, and the files are renamed as quoted below. This helps in sequential arrangement by default in the folder when "arrange by name" is chosen in "view" option. Also freeware like Google Picasa™ can be easily used to catalogue and retrieve images very quickly from the stored files on the disk by simple search of any of the words on the file name as mentioned earlier. It is mandatory not to use short forms for year and month. (E.g. patient id _2011_01_08_sl no is the correct form and not patient id_11_1_8_sl no) to avoid technical confusion on the operating system of the computer. Make it a point to show the images to the patient and discuss any clarification regarding the same that the patient requires. Take plenty of images. You can always delete the unused ones later. Clinical photography of hair disorders is an extension of dermatological photography. Some points should be kept in mind while taking images of the hair. For documentation of most conditions of the hair, the same general rules of dermatological photography apply. Special care should be taken in conditions requiring serial images to document progress/response to treatment and the most important factor in this context is consistency with respect to patient positioning, lighting, camera settings and background. We would like to thank Dr. Ricardo Azziz, Professor, Obstetrics, Gynecology, & Medicine and President, Georgia Health Sciences University (formerly the Medical College of Georgia), and CEO, MCG Health System, for giving permission to use his copyrighted image depicting the Ferriman-Gallway scoring system. 1. Kaliyadan F, Manoj J, Venkitakrishnan S, Dharmaratnam AD. Basic digital photography in dermatology. Indian J Dermatol Venereol Leprol 2008;74:532-6. 2. Miot HA, Paixão MP, Paschoal FM. Basics of digital photography in Dermatology. An Bras Dermatol 2006;81:174-80. 3. Pak HS. Dermatologic Photography [homepage] American Telemedicine Association; 1999. Available from: http://www.americantelemed.org/files/public/membergroups/teledermatology/telederm_DermatologicPhotography.pdf. [Last accessed on 2011 January 20]. 4. 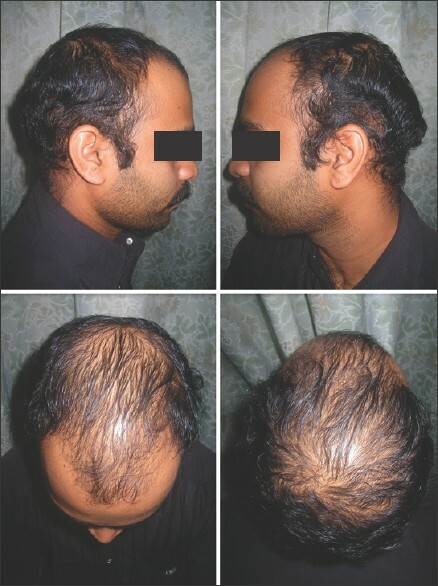 Canfield D. Photographic documentation of hair growth in androgenetic alopecia. Dermatol Clin 1996;14:713-21. 5. Kaliyadan F. Digital photography for patient counseling in dermatology-a study. J Eur Acad Dermatol Venereol 2008;22:1356-8. 6. Tosti A, Duque-Estrada B. Dermoscopy in hair disorders. J Egypt Women Dermatol Soc 2010;7:1-4. 7. Azziz R, Carmina E, Sawaya ME. Idiopathic hirsutism. Endocr Rev 2000;21:347-62. 8. Roach D. Imaging. In: Nouri K, Leal-Khouri S, editors. Techniques in dermatological surgery. 1 st ed. USA: Mosby; 2003. p. 33-42.